Getting braces has many benefits. Most patients that come to us wanting braces are looking to improve the appearance of their smile. While this is a great reason, and we’re glad to do it, straighter teeth have other benefits as well. Correctly aligned teeth are at a lower risk for developing tooth decay, gum disease, and they’re a lot easier to clean. The benefits don’t stop there. There are plenty of reasons for getting braces. Orthodontics can even fix jaw problems and facial deformities. Some patients suffer from headaches, neck pain, a sore jaw, and worn teeth – which are all side effects of having an improper bite. Braces can fix these issues – get you pain-free and prolong the life of your teeth. Overbite: Also known as a deep bite, this means that the upper front teeth significantly overlap the bottom ones. Underbite: You may notice that the lower teeth sit in front of the top teeth which is backward from how it should be. Crossbite: This is a combination of the two previous bites. Some teeth sit in front of their opposing ones, while others sit behind. Openbite: If there is an open space between the biting surface of your front teeth when your back teeth are bit together, then you have an open bite. Crowding: A narrow arch (or wide teeth) may result in your teeth being crooked, overlap each other and possibly not come in all the way. Spacing: A wide arch (or narrow teeth) may result in gaps between your teeth. Abnormal Eruption: A common problem found in patients with a narrow arch are teeth that aren’t in line with their neighbours. Braces are capable of moving teeth into the correct position. When is the Right Time for Children to Get Braces Put On? A consultation is always the first step in the process of getting braces put on. Typically, our Ottawa orthodontist likes to see your child when they’re seven years old. Most children won’t need braces until all of their baby teeth have come out, which is closer to the age of thirteen, but there are some benefits to seeing your child early. 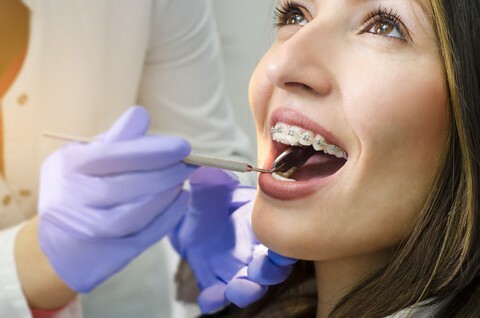 If we determine that your growing child’s mouth isn’t developing properly, we can intervene by going ahead and putting them in braces or an orthodontic appliance. This will get everything on track and their teeth and bone structure should continue to form on the right path. Early intervention can shorten the overall length of time that your child will have to be in braces. While we like to see patients as soon as possible, the good news is – it’s never too late for braces. In fact, every day more and more adults are choosing to go into orthodontic treatment! What Does Getting Braces Cost? The cost of getting braces depends on the type. Of course, you can get the traditional form of braces which are the metal brackets and wires. Some variations of this method have been used for decades to straighten people’s teeth. It works great for those that have severe bite issues that other ortho services can’t fix. The average treatment time for traditional braces is 12-24 months and is usually the most affordable option. However, we know that there aren’t a lot of teenagers, and especially adults that are fond of walking around and being seen with a mouth full of metal. Dr. Charles Cohen is trained in using the HARMONY System for lingual braces, which allows him to attach braces to the back side (lingual surface) of your teeth. No one will see that you’re wearing braces. The components used for this method are digitally designed and custom made for each individual. Invisalign clear aligner therapy uses plastic trays rather than metal components to straighten your teeth. They can be removed whenever you want to eat or brush your teeth. The aligners are nearly invisible, so most people won’t notice that you’re wearing them. They’re also much more comfortable than traditional or lingual braces. Throughout the Invisalign process, you’ll wear a series of plastic aligners that will gradually move your teeth. Each set of trays are worn for 1 week, for a minimum of 20 hours a day, before continuing on to the next pair. Invisalign shows equal results to traditional braces, and the retainers afterwards look just like Invisalign trays themselves. The best way to reduce your time in braces is to follow all the reminders given by our friendly team at Braces Haven. Keep your teeth clean and gums healthy, avoid very hard sticky foods, and wear your elastics as prescribed by Dr. Cohen. If you’re looking to straighten your teeth or have experienced some of the side effects of an improper bite then you should give us a call. Braces Haven in Ottawa offers a complimentary orthodontic consultation. Let us address all of your concerns and help develop a treatment plan that’ll get you the smile you’ve always wanted. Don’t think you can afford it? Our office offers a variety of payment plans to fit your family’s budget. So don’t wait any longer, Dr. Charles Cohen and his professional staff look forward to meeting you.